Corrosion is a global problem that costs the world US$2.5 trillion annually. This chemical process is most often seen on metal surfaces as rust and can result in catastrophic failure of infrastructure, such as bridges. Researchers at the Aramco Research Centre-Boston have teamed up with scientists at the Centre for Integrated Nanotechnologies (CINT) at Sandia National Laboratories – one of the US’s leading national laboratories – to investigate the nanoscale mechanisms responsible for corrosion initiation and progression in steel. 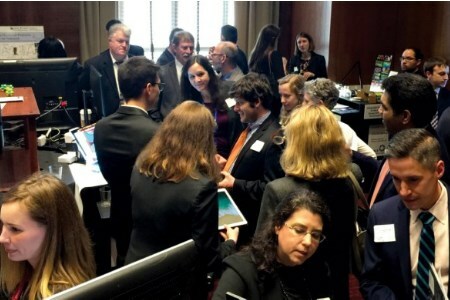 Recently, this team’s work was brought to the attention of the US Senate’s Energy and Natural Resources Committee at a user science exhibition. Representing Aramco at the event were Michele Ostraat, Steven Hayden, Rachael Grudt, and Antonya Sanders. CINT representatives included scientist Katherine Jungjohann and CINT Director Andreas Roelofs. Visitors then interacted with a sifting sand demonstration that explained the difference between uniformed and localised corrosion. The next step for the senators was to use a light board and puzzle together various graphical data sets that the team had 3D printed using in-house capabilities from the Boston centre. The final technique allowed the Senators to observe the results of the team’s most recent advancement – flowing a liquid solution over a steel sample about the size of a bacterium inside an electron microscope and watching in real time as corrosion initiated at the nanoscale level.